The California Nonprofit Technology Festival is a participatory and community-driven 2-day convening designed for nonprofit staff, grassroots and community organizers, social justice technologists, and those passionate about social change and technology. 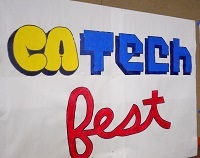 Join us for the next CA Tech Fest on 25-26 September 2014 in Richmond, California. We strive to address the technology challenges and opportunities that we face in our communities and collaborate on strategies to build statewide technology capacity to support the work of social justice. We are deeply inspired by the people in California working to build technology capacity within social justice movements. At the California Nonprofit Technology Festival, over 250 community-based organizations from 25 California communities have participated over the past two years. We are honored to be collaborating with many amazing organizations and people who make these gatherings possible. Below are the statewide partners from CA Tech Fests in Fresno 2012, Coachella 2013, Sacramento 2013, and Los Angeles 2014. We know that you are the leaders, organizers, and teachers in your communities. We look forward to supporting your online efforts so that you can continue to carry out your incredible social justice work.